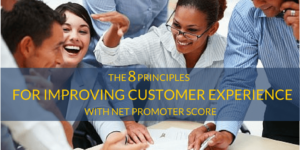 In my last piece I shared my thoughts on the why Net Promoter Score is so popular. I’ll now share the NPS program model I recommend. It’s intended for the novice NPS program owner, as well as the veteran NPS program owner who isn’t getting the expected traction or results. This model has evolved since the four years when I implemented salesforce.com’s first ever NPS program across 15,000 employees. I’ve since modified it to make it more agile to fit the needs of small and mid-size clients.